An 8 strain probiotic with 4 BILLION live bacteria per capsule to support a healthy gut! If you want to increase your live friendly bowel bacteria intake by a fantastic 4 billion, you can either eat 8 pots of probiotic yoghurt or take just 1 capsule of our Multi-Flora ProBio probiotic supplement - minus all the added sugar, dairy, fats and calories of yoghurt! 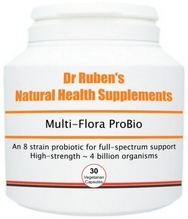 Multi-Flora ProBio can be taken during and following a course of antibiotics, when travelling abroad and to support a healthy balance of bacteria in the gut. It provides the ideal environment for digestion and healthy bowel regularity and offers full spectrum support of the upper and lower bowel. Guaranteed strength for 12 months from date of manufacture. This probiotic has been specifically manufactured to be heat-resistant and, as such, does not require refrigeration, which makes it perfect for travel. It is also micro-encapsulated for acid-resistance and is able to withstand stomach acid, helping the friendly bacteria to reach the colon alive and in optimal condition. 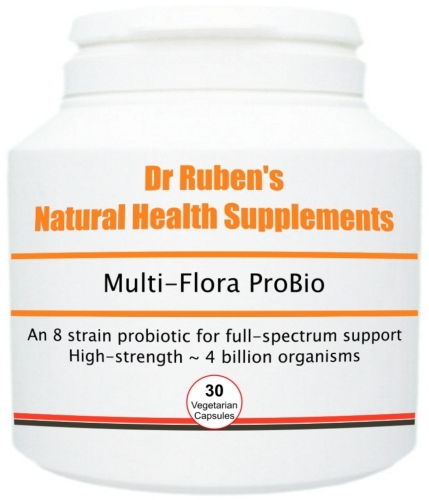 If this 8 strain bacteria probiotic is taken alone (as opposed to in combination with other digestive health supplements), start off by taking a higher intake of 3 - 4 capsules, split up throughout the day with food for 2 - 4 weeks. Thereafter, reduce intake to 1 capsule taken 1 to 2 times per day.